This blog describes why art matters. You will develop a set of tools enabling you to see the art in works of art. You will learn to see the way artists’ see. You will transform the very world you thought you were seeing every day into visual adventures. You will be equipped to do this work by learning to see. At the end of my previous post, “A Cuban Adventure Totally Objective,” I said I would revisit the need to transform subject facts into picture facts if appreciating the art in painting is the goal. Since then, I fell into that blank space writers unhappily know all too well: I had no idea how to approach this topic without repeating past posts. Its other name is writer’s block. So I wallowed in this misery until this morning. 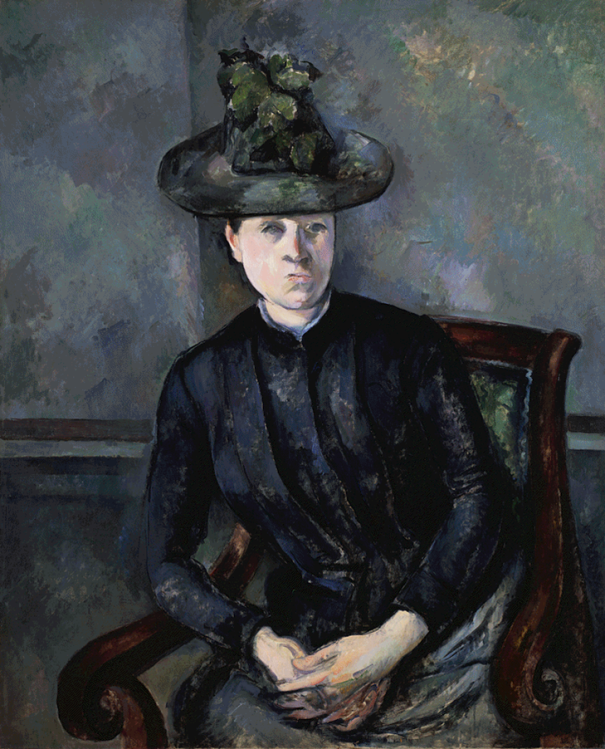 Then, like a gift, as I ran in the freezing air, I connected two disparate exhibits: a Matisse exhibit at the Met I visited a few weekends ago and a new exhibit at the Met, “Impressionism, Fashion and Modernity,” that opens February 26. Roberta Smith summarized the new one, “Impressionism,” this way: “In fresh, groundbreaking ways this show details the entwined rise of modern painting, modern fashion and modern (upper middle-class) life over some two dozen years of rapid change in Paris, 1862-1867.” (New York Times, 2/22/13, pp. C1 and C21). 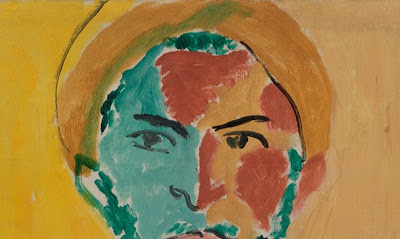 In other words, the “Matisse” exhibit encouraged viewers to do the work of art (with work used as a verb, since what we do is definitely labor intensive). In the “Matisse” exhibit, Matisse’s painting “The Large Blue Dress” hangs to the left of the skirt Lydia Delectorskaya, his model, wore while posing. Rebecca Rabinow tells us, in the catalog to the exhibit, Lydia made the dress herself: “a blue gown with leg-of-mutton sleeves, embellished with white organza cuffs and ruffles along the edges of the overskirt, neckline, and bodice.” (“The Woman in Blue,” Matisse: In Search of True Painting, 2012, The Metropolitan Museum of Art, pp. 142-143. 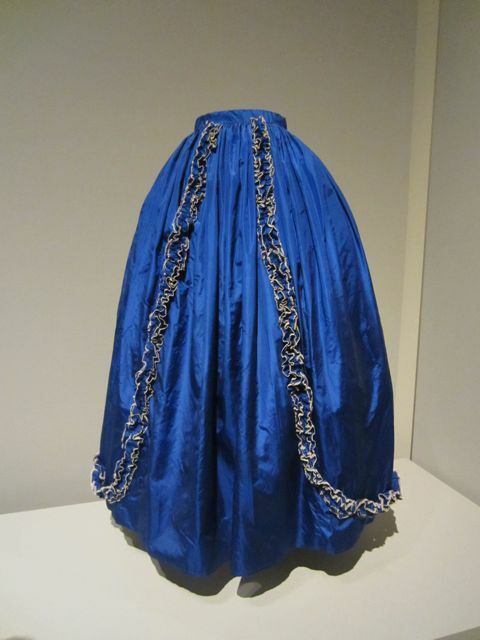 Matisse used this skirt. He converted it into oil paint (color) and brushed that color onto a canvas (a flat surface). The created color unit (no longer a skirt, is it?) now serves as one visual clue to the aesthetic meaning of the picture. What do “feelings” mean in this context? And what is the “essence” of an object? In Dr. Barnes and Violette de Mazia’s vocabulary, feelings are the broad human qualities an artist perceives in an object (feelings like power, drama, fluidity, delicacy), that become the “essence” of the object as an artist transforms a subject into a picture idea. 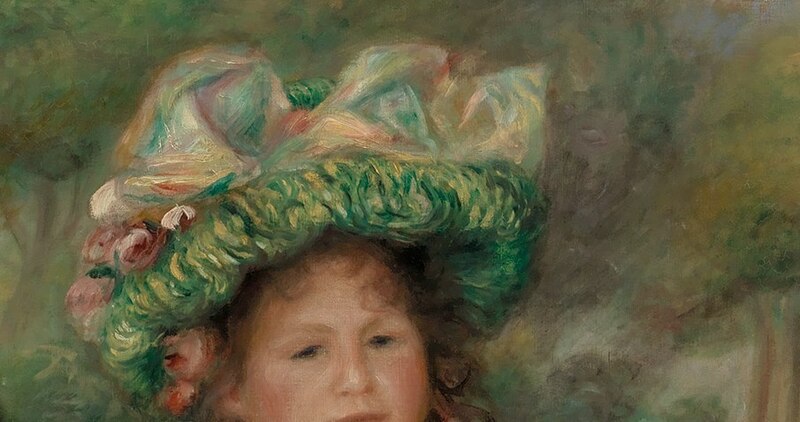 It is as if the artist says, “I feel a strong sense of solidity in this apple,” or “I feel such delicacy and fragility in this landscape.” At this moment, whatever the object was (apple, chair, hat, skirt, tree), it becomes a color unit and is orchestrated into a color composition. The artist creates an entirely new object, a picture. And embedded in the picture is the meaning of the artist’s aesthetic experience. My classroom students tell me they know this. They feel insulted when I remind them that a color unit is not the same as what it represents. But when they look at a painting, they continue to describe the colors on the flat surface as if they were trees, or apples, or figures. Let’s look at this another way. In one of the last essays Violette de Mazia wrote, she examined the use of headdresses in painting. 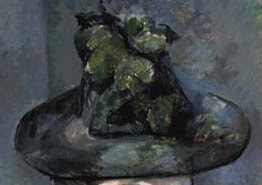 She described “hats” used by Cézanne, Renoir, and Matisse, not the same hats, but the use of “hats” as they functioned in each picture—in the broad human values expressed as revealed by the qualities each “hat” embodied. 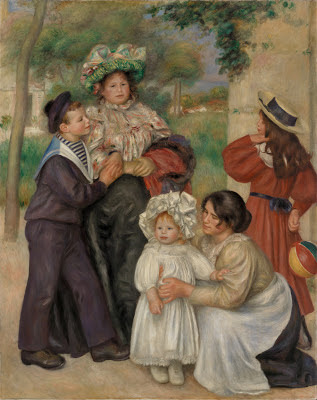 In Cézanne’s picture, power and architectural equilibrium are expressed, and the color unit that says “hat” fits that purpose; in Renoir’s picture, fluidity, warmth, and richness are expressed, and the units that say “hats” fit that purpose; in the Matisse, the contrast of exotic color drama comes about by pattern of shapes, and the “hat” fits that purpose. Now examine the Matisse painting that started this exploration: The Large Blue Dress. Matisse transformed Lydia Delectorskaya wearing her blue dress into a series of symmetrical arabesques, flattened bright color units, set in a subtle space recession. He uses single flat colors evenly filling a pattern of clean-cut areas—an idea that eventually leads him to paper cut-outs. For the artist, the conversion of subject to picture idea occurs in magic moments that change everything. 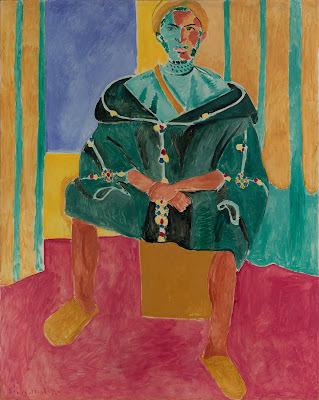 While Matossian’s photographs reveal some of the revisions Matisse made to this picture over a period of time, they do not account for the why. The picture holds the answer, and we discover it by uncovering the art in it. 1. The background black grid sets off the “swan’s neck” yellow arabesque, followed by the red arc with its pink linear pattern, and the blue-gray curve of the “skirt,” all units sliding one behind the other. 2. The white “skirt’s trim” rhythmically echoes the yellow arabesque. 3. The internal pink linear pattern in the red arc is rhythmically echoed in the gray rectangle above and to the right of the black grid’s top arc. 4. 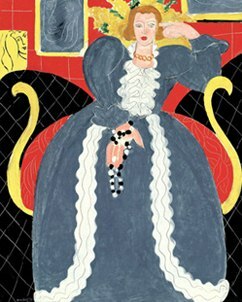 The curvilinear pattern of the “skirt’s trim” is echoed in the smaller yellow rectangle to the left of the gray one. 5. The red background repeats the grid of the black arc, but with larger rectangles. 7. All the color units move backward from the bulbous shoulder, arm, and skirt in a series of curvilinear, dovetailing shapes. 8. The red arc sets the mid-space and allows the background red to move behind the top yellow rectilinear color areas. 1. Now the red background, the shape of a larger arc, rhythmically balances its twin on the left while, at the same time, its angular top bends inward like the number 3. 2. 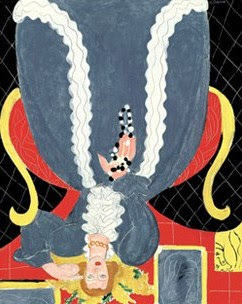 The yellow arabesque, pushed to the edge of the right side of the picture, hugs the red arc while the gray-blue “sleeve and cuff” and the ball-shaped shoulder slide behind it. 5. The gold open circles of the “necklace” connects to the semi-circle of gold hair and continues the motif of black/white circles enveloped in the downward flow of the “foliage-shaped hand” that echo the yellow “flowers” behind the oval head. 6. The red “mouth” sets the spatial key for all the red units. Take a good look at those spatial rhythms. I think you will enjoy the experience. Or spend some time with the pinks lined in white of the face, neck, and hands to enjoy how those repetitions echo the white/gray motifs in the “dress’s” trim, then reverse in the dress’s gray/white units. I could go on, and the surprise of this statement is two-fold: at first glance, this picture looks effortless, facile even, simple enough to see in one quick look. However, only when you look at it long and carefully do you see the decorativeness of the flattened, compactly wedged planes, the balancing of foreground and background into a single, rhythmically organized surface, and the arabesques of areas and lines. Insight rewards the work of art. Insight allows us to discern the true nature of a situation and to grasp the inward or hidden nature of things. As I said in a previous post, insight makes the invisible visible (see Making the Invisible Visible). I hope you visit the Met to see both exhibits. “Impressionism, Fashion and Modernity” opens February 26 and closes May 27, 2013. “Matisse: In Search of True Painting” closes March 17. For more information, click here: The Metropolitan Museum of Art. We came in second for the Fascination Award, and we are listed in the Top 20 Art Teacher Blogs of 2012. Thank you for voting for me!